Click/tap here to find the best Katy, Texas massage therapist for your needs! 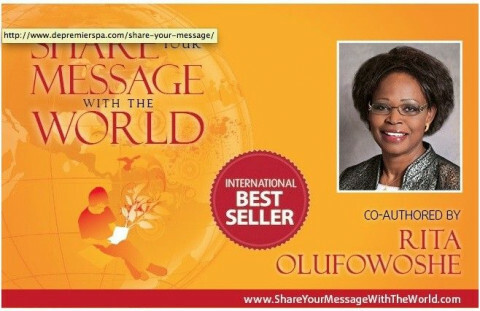 Rita Olufowoshe is an International Best Selling Author in a book – “Share Your Message with the World”. Her chapter in the book is 27 - “Health and Wellness in Your Hands (Listen to Your Body’s Wakeup Calls)”. She is the founder and CEO of a thriving Center for Aesthetics and Wellness Spa, LLC (De Premier Spa). She has been in the spa industry for over 25 years. Since 1992, she has owned and managed two-day spas, and recently opened a third one in Houston, Texas. She studied aesthetics, cosmetology, and massage therapy in Netherlands, Canada, and United States. She is a Medical Massage Therapist and Medical Aesthetics Provider, a professional member of AMTA, ABMP, ASCP, BNI and has National Provider Identification number (NPI). Rita has degree in Business Administration, Masters in Healthcare Gerontology and currently completing Personal Trainer Certification. Her focus is to encourage, motivate and educate people to be the CEOs of their health and wellness, by listening to their body's wakeup calls, and taking necessary actions before chronic health issues set in. As a licensed professional, she integrates medical aesthetics with alternative and complimentary therapies to treat and educate clients in achieving health and wellness goals. Rita provides personalized skin care and wellness programs using cutting-edge techniques. Taking into consideration today's health and wellness challenges and tomorrow's needs, she provides clear, simple solutions that work and will keep you feeling and looking healthy from inside out for many years to come. You Have Your Health in Your Hands! Listen to Your Body's Wakeup Calls. If you don't, Who Will? As a licensed registered professional and National Provider, she integrates medical aesthetics with alternative therapies to advise and educate clients in achieving wellness goals. She is dedicated to the power of touch and the healing that it can provide. Rita believes in giving back to the community through volunteer programs - providing spa and massage services to senior's homes, Churches, Hospitals, Veterans. Her latest giving back to the community is massage for Teachers.